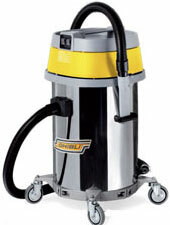 A medium-size wet/dry vacuum cleaner equipped with a robust stainless steel container, a new metal trolley with 4 pivoting wheels featuring a large diameter (100 mm) to ensure the maximum transportability on every kind of surface. The standard equipment has been developed exclusively for the user: a crevice tool made of a special rubber, which doesn’t leave marks (developed to avoid any damage caused by an impact or by stepping on it), a rubber curved tool with a brush and a 4 meters long complete hose (to easily reach any area without the need to move the vacuum cleaner), an antistatic kit and a washable TNT filter (made of polyester). Wet/dry vacuum cleaner with a new metal trolley (4 tilting wheels , Ø 100 mm) to ensure the maximum transportability on every kind of surface. Equipped with two motors that can be controlled separately. A drain hose makes emptying the tank easy. The standard accessories have been developed exclusively for the user: a crevice tool made of a special rubber, which doesn’t leave marks (developed to avoid any damage caused by an impact or by stepping on it), a rubber curved tool with a brush and a 4 meters long complete hose (to easily reach any area without the need to move the vacuum cleaner), an antistatic kit and a washable TNT filter (polyester). 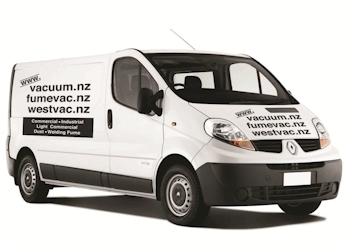 Outstanding performances are shown by this wet/dry vacuum cleaner thanks to its three motors, with the possibility to use a single motor, two or even three motors at the same time. The new metal trolley (4 pivoting wheels , Ø 100 mm) allow the maximum transportability on every kind of surface and the drain hose system makes emptying the tank easy. In standard equipment, along with a washable TNT filter (polyester), an antistatic kit is included. 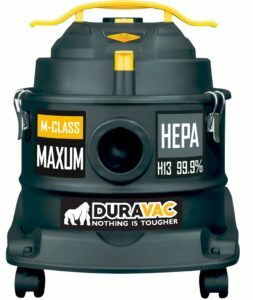 The standard accessories have been developed exclusively for the user: a crevice tool made of a special rubber, which doesn’t leave marks (developed to avoid any damage caused by an impact or by stepping on it), a rubber curved tool with a brush and a 4 meters long complete hose to easily reach any area without the need to move the vacuum cleaner. 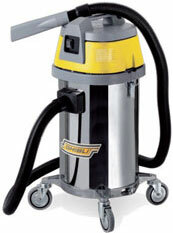 A wet/dry vacuum cleaner with a good capacity and a great power, equipped with a new metal trolley (4 pivoting wheels, Ø 100 mm) to ensure the maximum transportability on every kind of surface, a stainless steel tank and an antistatic kit. The standard accessories have been developed exclusively for the user: a crevice tool made of a special rubber, which doesn’t leave marks (developed to avoid any damage caused by an impact or by stepping on it), a rubber curved tool with a brush and a 4 meters long complete hose (to easily reach any area without the need to move the vacuum cleaner) and a washable TNT filter (made of polyester).